Almost totally unnoticed amid the clutter of modern buildings near the port, this cross was set in place in 1799 to commemorate the reconquest of the Kingdom of Naples by Ruffo's Army of the Holy Faith. 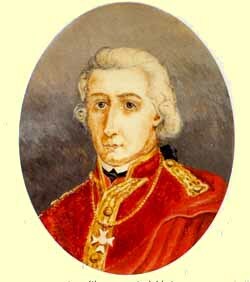 Cardinal Fabrizio Ruffo (1744—1827) (photo, below) figures prominently in the history surrounding the short-lived Neapolitan (or Parthenopean) Republic of 1799; he was the one who formed and led the loyalist Army of the Holy Faith in its campaign to retake the kingdom of Naples from the forces of the Revolution. He was born at San Lucido in Calabria in 1744, son of Litterio Ruffo, duke of Baranello. He was educated by his uncle, the cardinal Thomas Ruffo, as a result of which he gained the favor of Giovanni Angelo Braschi di Cesera, who in 1775 became Pope Pius VI. Ruffo became a member of the papal civil and financial service and was created a cardinal in 1791, though he had never been a priest. He then went to Naples where he was named administrator of the royal domain of Caserta. When the French troops advanced on Naples in in December 1798, Ruffo fled to Palermo with the royal family. He was chosen to head a royalist movement in Calabria with the goal of advancing north on Naples and overthrowing the revolutionary government. He landed at La Cortona on February 8, 1799 and began to raise the "Army of the Holy Faith," organizing for his cause the aid of well-known Calabrian bandits such as Fra Diavolo and Nicola Gualtieri, known as "Panedigrano". It is impossible to find an impartial statement about the conduct of Ruffo's army as it marched north. On the one hand, he is described as somewhat of a Robin Hood, out to free his kingdom from the French. On the other hand, he is said to have done very little to prevent his bandit army from killing and pillaging as they went. Supporters point to Republican atrocities, as well. Perhaps all that can be said is that neither side was particularly interested in taking prisoners. Whatever the case, by June, Ruffo's army had advanced to the city of Naples. When the French army occupying the city in support of the Republic withdrew to the north, the revolution was doomed. If we show that we want only to put on trial and to punish ... we close the path to conciliation... Is clemency perhaps a fault? No, some will say—but it is dangerous. I don't believe that, and with some caution I believe it preferable to punishment. Clemency was not to be, and Ruffo was then genuinely outraged when his guarantee was violated by the King of Naples, Ferdinand (certainly at the behest of Queen Caroline), who had the refugees removed from ships in the harbor, returned to prison, and put on trial. Ruffo, himself, was part of the tribunal that was now to sit in judgment on the revolutionaries. He was so inclined to be forgiving and lenient that the King removed him from the tribunal. The French, under Napoleon, retook the Kingdom of Naples in 1806 and stayed until Napoleon's ultimate defeat almost 10 years later. Interestingly, Ruffo stayed in Naples during the French decade. He apparently lived calmly and undisturbed by the French, who might have had reason to act otherwise toward their former enemy. When the Bourbons were again restored to the throne of Naples, Ruffo took a ministerial post in the government and again became a confidante of the same King, Ferdinand IV (now known as Ferdinand I) whom he had aided so many years earlier. 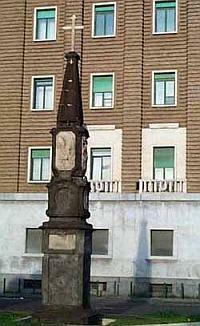 Ruffo died in 1827 in Naples.